On Saturday, 20 July, inside the Banquet Hall, Government House, Yenagoa, Bayelsa State, 32 beautiful ladies danced, twirled and flashed their apparels in a keen quest for tiara — and cash. 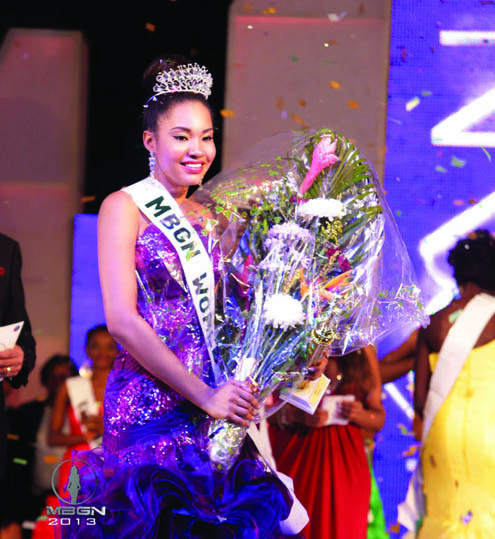 At the end, 18-year-old Anna Ebiere Banner, representing Bayelsa State, was named the Most Beautiful Girl in Nigeria, MBGN, 2013. With the crown, Anna’s life has taken a positive trajectory. Banner, an undergraduate of University of Port Harcourt, walked home with N1 million cash prize, an investment package worth N500,000 from a finance company, a brand new car, a Cartier luxury wristwatch from Polo Limited and most importantly, she will represent Nigeria at the Miss World pageant, holding in Jakarta, Indonesia, on 28 September. Not only that, Banner, as an indigene of Bayelsa, the host state, was appointed the Special Assistant on Culture and Tourism to Governor Henry Seriake-Dickson, and will serve as the state’s ambassador. “I want to thank God for this achievement. He made it possible. I am so shocked but overwhelmed with joy. I thank everyone who voted for me,” Banner told newsmen after she was crowned by the immediate past MBGN, Isabella Ayuk. Stephanie Okwu, a 19-year-old undergraduate at the University of Lagos, representing Imo State, emerged the first runner-up. She will represent Nigeria in the Miss Universe 2013 beauty pageant in Moscow, Russia. Adamawa State’s representative, Powede Lawrence, 20, was the second runner-up and will represent Nigeria in the Miss Tourism 2013 competition. Prior to her emergence, Banner come tops in the Best Traditional Costume category. Other winners were: Blessing Obi (Miss Kano), as Miss Photogenic; Aderonke Tiamiyu (Miss Ogun), as Miss Charismatic, and Fontanne Bassey (Miss Akwa Ibom), who was voted Miss Amity by her co-contestants as the most gentle and social. After auditions across the country, 34 beauties were adjudged eligible for the competition. They were camped for two weeks in Yenagoa, where they were tutored and groomed on the rudiments of the pageant before the grand finale. Two were however dropped midway. A keen contest saw the 32 beauties reduced to the Top 15, from which the Top 5 emerged. Others who made it to the Top 5 were 21-year-old Melisa Devidal (Miss Abuja), who was the 4th runner-up, and 24-year-old Enoma Agbonifo (Miss Kaduna), the 3rd runner-up. 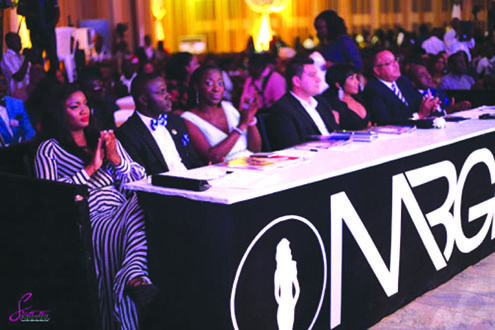 Two of the contestants––Miss Abuja and Miss Imo––were the initial favourites for the crown. While poise and presentation may have been Miss Imo’s Achilles’ heel, stage fright, apparently, was Miss Abuja’s undoing. She hit a major roadblock when she was unable to remember the answers she initially gave to questions posed to her. “This Miss Abuja just lost the crown because she obviously crammed the answers, which affected her delivery tonight. It would have made sense for pageant contestants to look up to contestants from past pageants. They can look to them for inspiration on poise, presentation and even how they handled the question-and-answer session,” said Helen Tuodolo, an Abuja-based finishing school instructor. Top movie actress, Omotola Jalade- Ekeinde, was honoured with a special recognition award by the Silverbird Group during the night. She was one of the MBGN 2013 judges. On the panel with her were Captain Bunmi Williams, Head, Uyo International Airport, Akwa Ibom State; Mohammed Jammal, a recording artiste; Jason Newsome, Hollywood celebrity producer/artiste; Ebizi Brown, Director-General, Bayelsa State Tourism Development Agency; John Opara, General Manager, Lufthansa, Abuja; Ini Okorie, a businessman, and Thandeka Sibisi, Executive Director, Two Glowing Sunset SA. Governor Seriake-Dickson, in his remarks, said the state considered it a unique privilege to have such an array of important personalities and elegant young ladies in their midst for the pageant, just a couple of months after hosting the prestigious Africa Movie Academy Awards, AMAA. 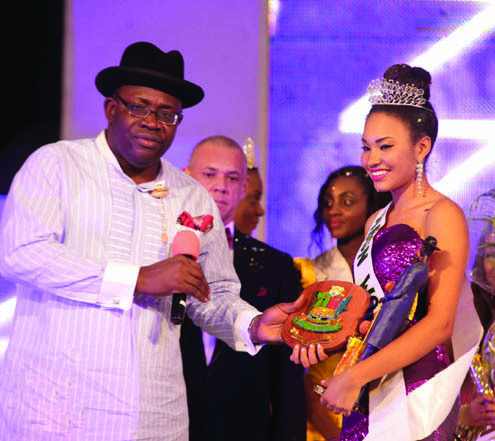 “For us, playing host to these two historic events within a space of just four months gives credence to the fact that Bayelsa is fast growing to become the next tourism hub of the country and beyond,” he said. The governor, who used the opportunity of the pageant to drive home the message of his government’s commitment to diversifying the economy of the state from dependence on petroleum products to a reliance on tourism and agriculture, said the events and many more to come are also a testament to the existence of unassailable peace and security in the state. Guy Murray Bruce, Vice-President, Silverbird Group, said he appreciated the vision of the governor, and thanked him for making the event a success. “This represents the promotion of the culture, tourism and good people of Bayelsa. For us and the contestants, this is an experience filled with lifetime memories that will be shared among family and friends for generations to come,” he said. The age limit for MBGN participants has been reduced from 26 to 23. Since its inception in the 1980s, the competition had been open to ladies between the ages of 18 and 26. The reason given for the change was that the age limit for Miss World is 25, and the winner of the MBGN pageant goes on to represent the country on the world stage. Ayuk won the pageant last year at the age of 25; officially ineligible by age to contest in the Miss World pageant held in Mongolia, China in August last year. Diamette Charles Granville, the first runner-up, eventually represented Nigeria at the pageant. In its 26th edition, MBGN 2013 was produced by Silverbird Productions, in conjunction with the Bayelsa State Tourism Development Agency. It was compered by Chris Okenwa of Rhythm94.7 FM Abuja, and Chioma Agwunobi of Silverbird Television, Lagos. There were musical performances by Kcee, Timi Dakolo and Jaared, a United States-based hip-hop artiste.